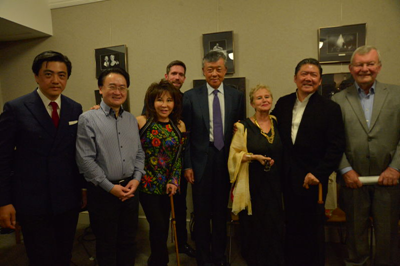 On May 14, 2017, Ambassador Liu Xiaoming and Madame Hu Pinghua attended the premiere of Guangzhou Symphony Orchestra during its first UK tour at Cadogan Hall. More than 600 audience including British celebrities, James Williams, Managing Director of the Royal Philharmonic Orchestra, Kevin Fewster, Director of Royal Museums Greenwich and Douglas Flint, Group Chairman of HSBC watched the performance. The concert, conducted by Maestro Yu Long of Guangzhou Symphony Orchestra, opened with Four Sea Interludes from Perter Grimes by renowned British composer Benjamin Britten. Then the Orchestra, together with cellist Wang Jian and Jia Lei, the performer of Sheng, performed Duo for Sheng, cello and Orchestra created by Zhao Lin, a young Chinese composer. The piece combines traditional Chinese and Western instruments and highlights cultural integration between the Eastern and Western civilizations, which corresponds with the theme of Belt and Road Initiative. In the second half of the concert, the Orchestra performed Guangdong Suite by famous Chinese composer Ye Xiaogang, showcasing the melodic and lively music of Guangdong in the form of symphony. The concert finally drew a satisfactory conclusion with Stravinsky's the Firebird Suite. The audiences were enthralled by the emotional, melodious and superb interpretation by the artists. Amid the warm applauses, the artists took several curtain calls. Ambassador Liu visited the artists of the Orchestra after the performance. He first expressed his warm congratulations to the artists on their success. 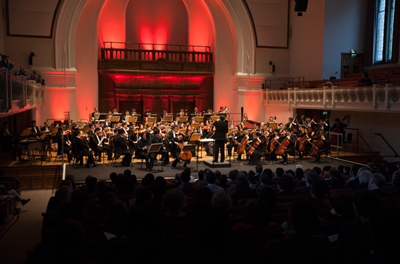 Noting the 45th anniversary of China-UK ambassadorial relations, the ambassador said the timing of Guangzhou Symphony Orchestra's first UK tour with classic Chinese and British music not only demonstrated the spirit of cultural integration and mutual learning advocated by the Belt and Road Initiative, but also added to the chorus for the promotion of cooperation and deepening friendship between China and the UK. Ambassador Liu also noted that the 2017 Fortune Global Forum will be held in Guangzhou this year, and Guangdong Province will carry out a series of promotions in various countries including the UK to present a more fascinating Guangzhou to the world. The Orchestra's visit to the UK at this time creates a favorable atmosphere for the upcoming promotional activities in this country. In closing, Ambassador Liu wished the Orchestra's UK tour a complete success. 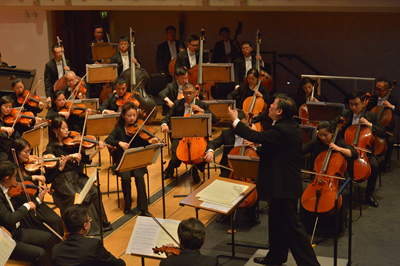 Guangzhou Symphony Orchestra, founded in 1957, is one of China's prestigious orchestras. In its first tour in the UK, the Orchestra will host two more concerts in Manchester and Birmingham.